PistachiosVitamin K: 684% of the RDA. You get all of this and more for the low price of 33 calories and very little fat. That, my friends, is why kale is deserving of the crown. Furthermore, kale is actually pretty versatile. It can be sliced into ribbons and eaten raw in salads, sauteed or added to pasta, soups and stews. Or you can make this delicious Kale Pesto which is a sneaky smart way to get kale onto the dinner table. 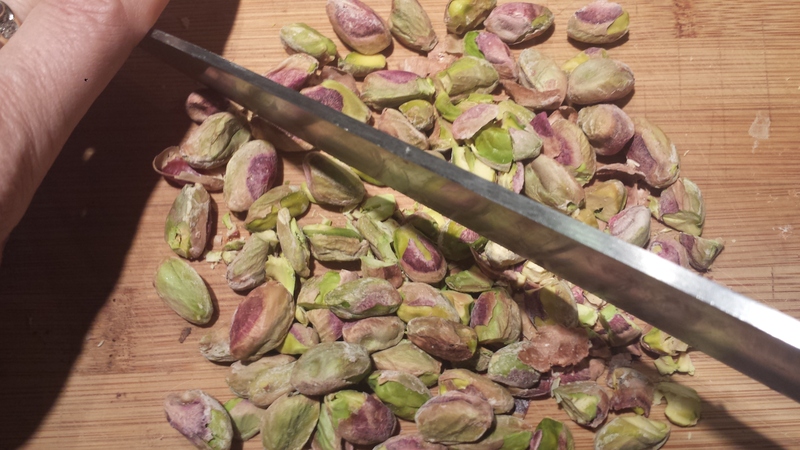 BTW, Pistachios are no slouch either, adding protein, beneficial antioxidants, vitamins B and E, and a whole slew of minerals, including iron. 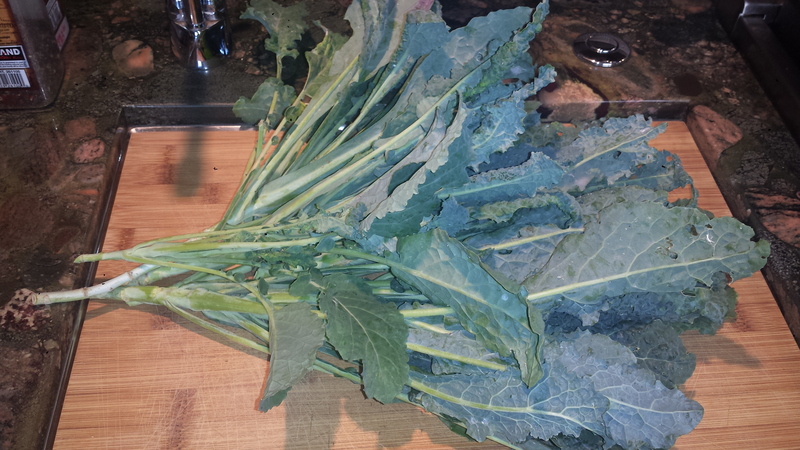 I used baby kale from my garden but any dark leafy green would work well too, like spinach, mustard or collard greens. 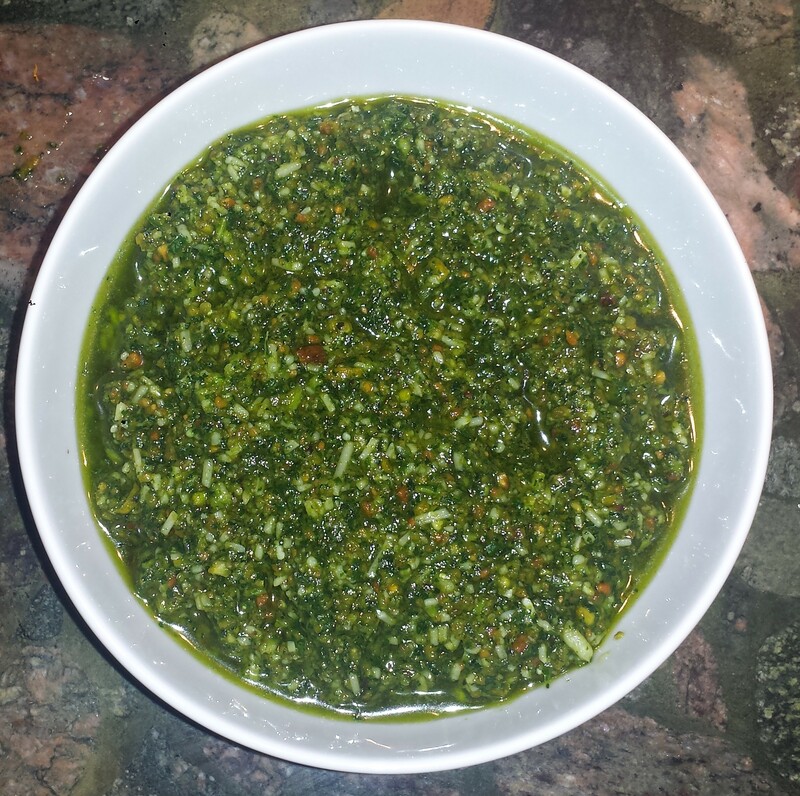 Arugula would made a nice, zesty pesto. 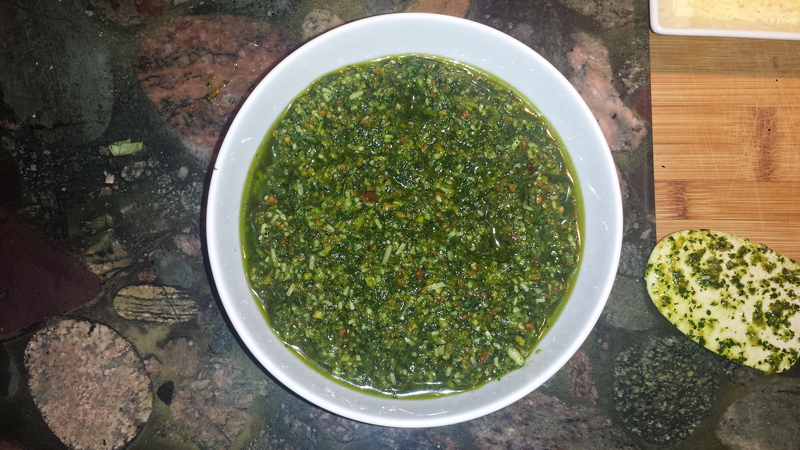 Since its uncooked, this sauce works best with young leafy greens. if you want to give it a try with larger, more mature leaves , I would recommend removing the stems and larger ribs and blanching them in boiling water for 45 seconds, then running them under cold water. Squeeze the water out with paper towels before processing to avoid a too watery sauce. I hate eating empty carbs so try to use whole grain pasta whenever possible. Whole grain pastas have come a long way in the past few years, in response to demand for high quality healthful ingredients. 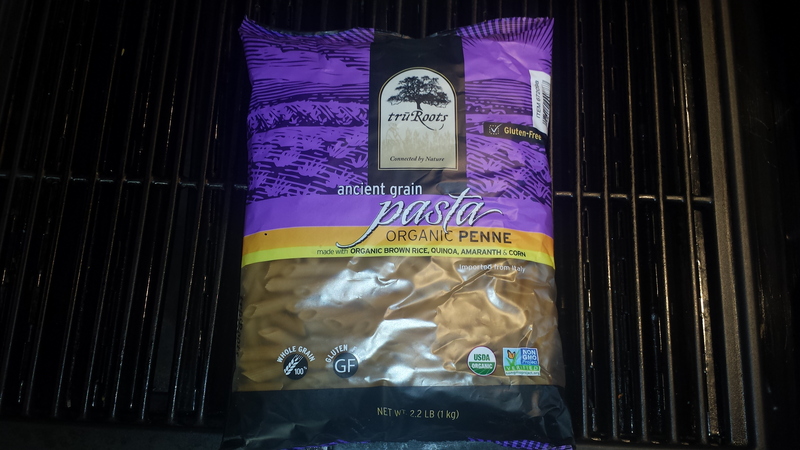 I like Tru Roots Ancient Grain Penne Pasta which is organic and gluten free, made with brown rice, quinoa, amaranth and corn. It has a great texture (not gluey like so many others) and tastes like regular pasta. It’s also available at Costco so I buy it in volume. TIPS: To further boost flavor and nutrition, try topping your pesto pasta with roasted butternut or summer squash which adds a creamy sweetness. Just peel and cube squash, drizzle with olive oil, sprinkle with salt and pepper and roast at 450 degrees for about a half hour. Let cool slightly and toss with pasta. Yum! 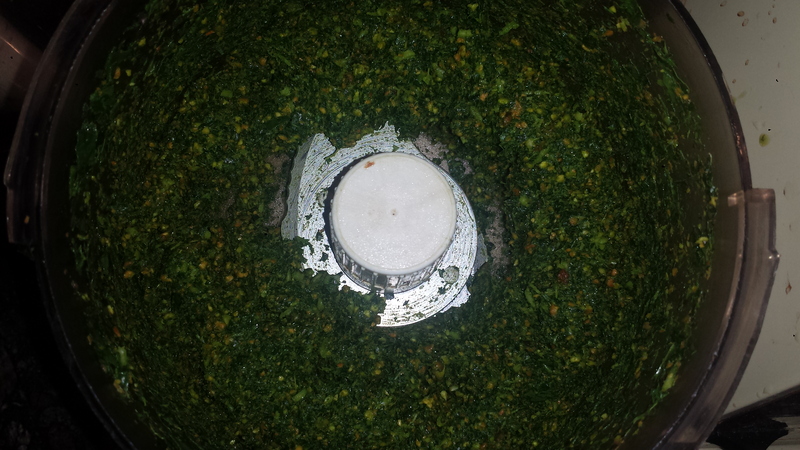 Roughly chop the kale and place it in a food processor with the pistachios and garlic. 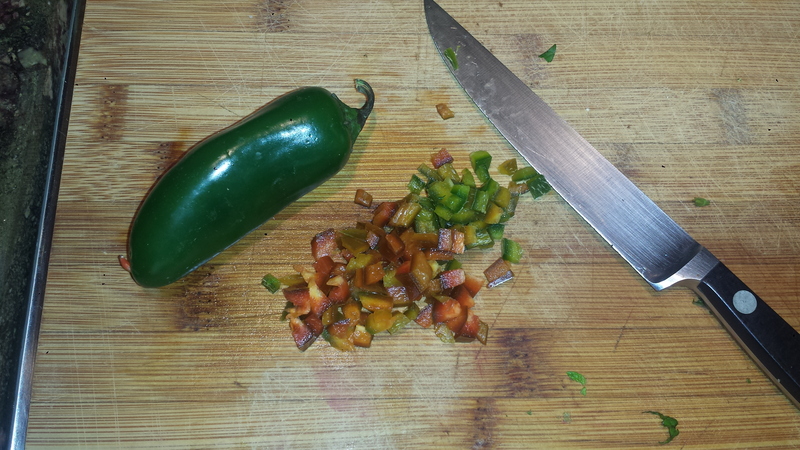 Pulse until coarsely chopped. Bring a large pot of salted water to a boil. Cook the pasta for 8-10 minutes or until al dente. Scoop out a cup of pasta water and set aside. Drain the pasta. 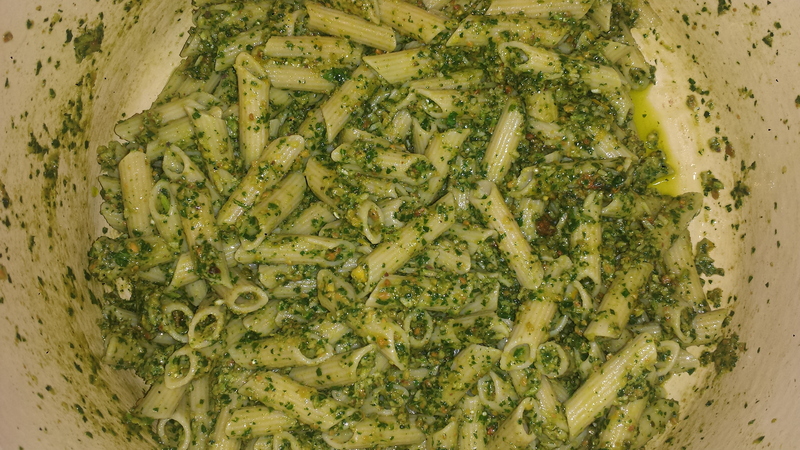 Add the hot pasta to the bowl with pesto and toss well to evenly coat. Add some of the reserved cooking water if necessary. 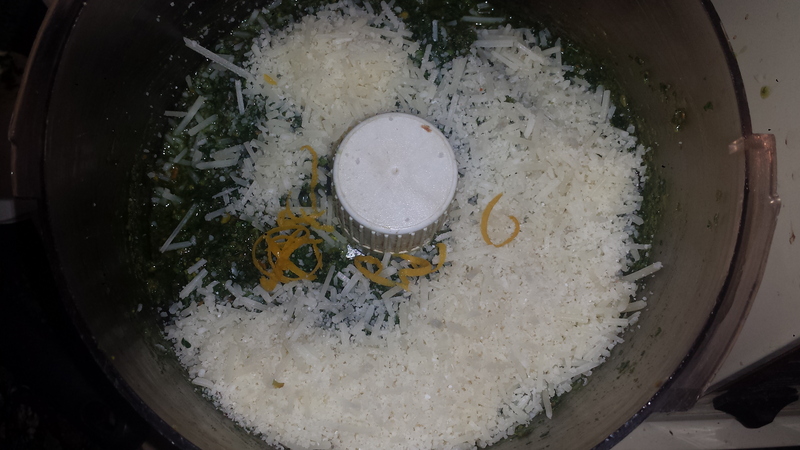 Serve with fresh basil and more lemon zest and parmesan, if desired. To make ahead or store, put in a container, cover the surface with a little more olive oil and keep in the refrigerator for a week, or freeze for up to a month. 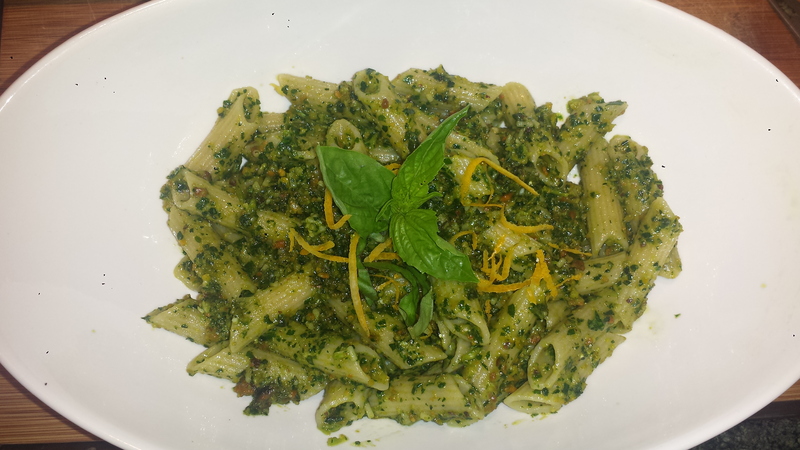 Serve with fresh basil and more lemon zest and parmesan, if desired. To make ahead or store, put in a container, cover the surface with a little more olive oil and keep in the refrigerator for a week, or freeze for up to a month. Are you a lover or a hater? Cucumbers have a reputation for being boring. I don’t agree. 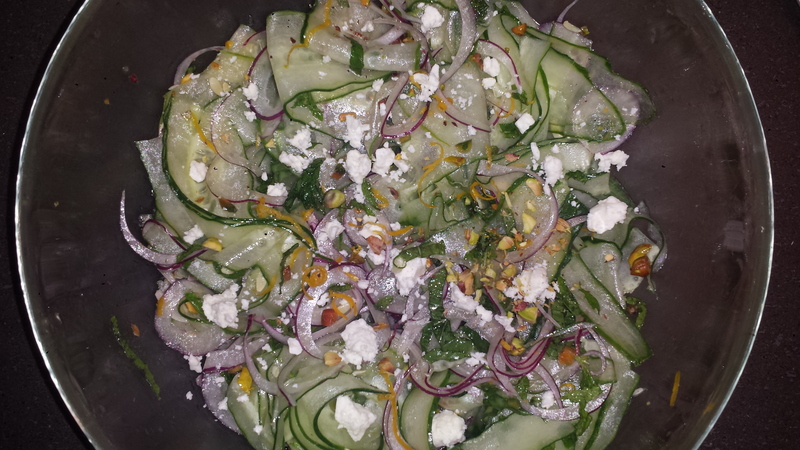 I love cucumbers and this salad, which is refreshing and definitely not boring, brings it! There is a bit of a kick and crunch with added jalapenos, lemon zest and pistachios. 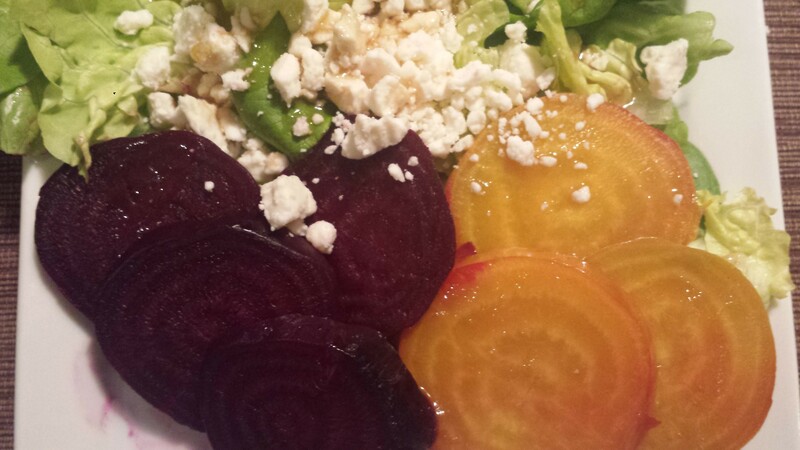 Topped with crumbled feta and a drizzle of red wine vinaigrette and you have a taste sensation. Did you know cucumbers have a secret? Scroll down for the big reveal. 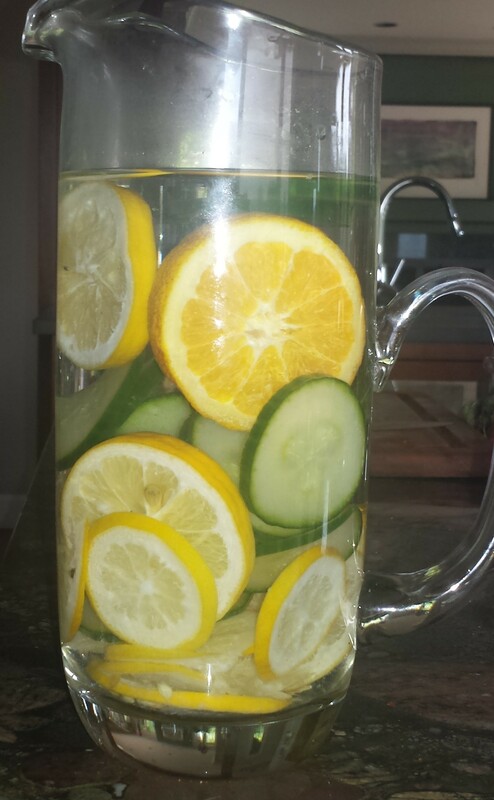 I am on the cucumber bandwagon and drink Lemon Cucumber water every morning (recipe HERE) but know there are haters out there, including my future daughter in law. 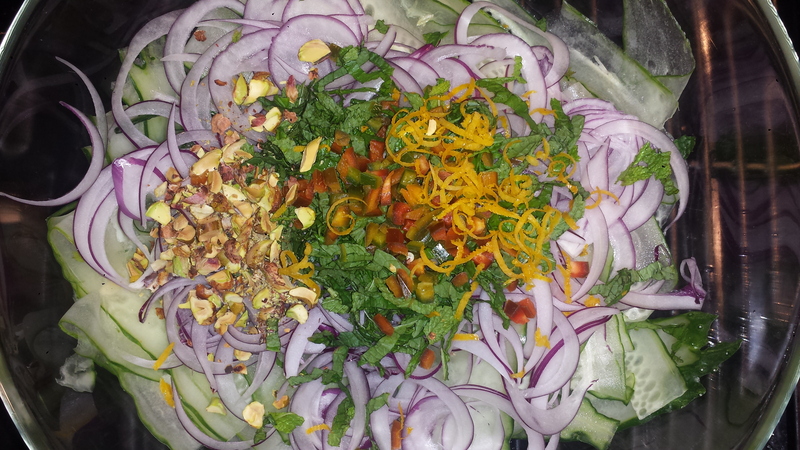 (For her I make strawberry, lemon, blueberry water or other concoctions) So, if you avoid cucumber but like the ‘idea’ of this salad, just substitute zucchini. Win! 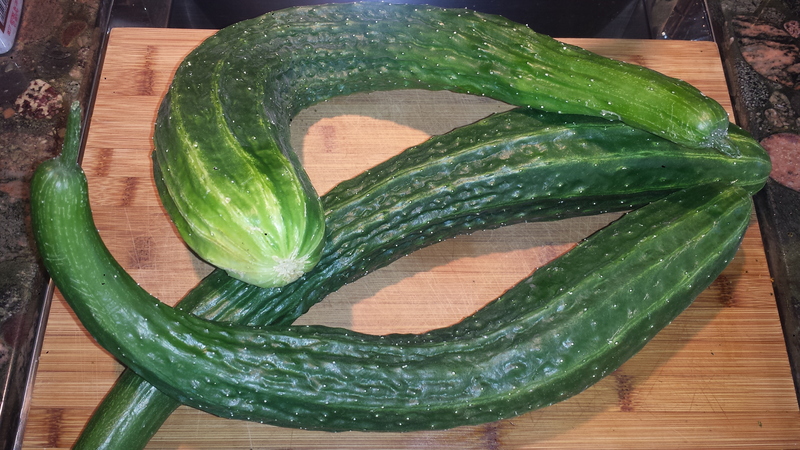 I was gifted a bag of lovely Heirloom Japanese long cucumbers from my friends, Linda and Michael Rosso, and their prolific garden in Sonoma. Aren’t they fabulous? Linda tells me that one plant has already yielded 20 of these babies and summer is not over yet. Linda and Michael own Sonoma Rosso, a California Wine Country getaway in Kenwood, California that offers a one bedroom guest cottage with access to a salt water pool and an organic garden. Yes, you can keep what you pick! I haven’t been lucky enough to see it yet, but it looks like a beautiful spot for getting away. Click on the LINK for more information. Here’s a photo of Michael harvesting ‘my’ cucumbers and other produce from their garden. TIPS: Cucumbers have a lot of water which makes them a super healthy snack but in salads, they continue to release water so this salad should only be made just before needed, otherwise it will be sitting is a pool of water. To store any leftovers, pour off excess water before refrigerating and toss with a bit more vinaigrette and fresh mint to refresh. Using a mandolin, slice cucumbers on the thinnest setting. Cucumbers don’t need to be peeled unless they have thick and bitter skins. Place in a large serving bowl. Whisk together the oil, vinegar, salt and pepper. Taste and adjust seasonings. 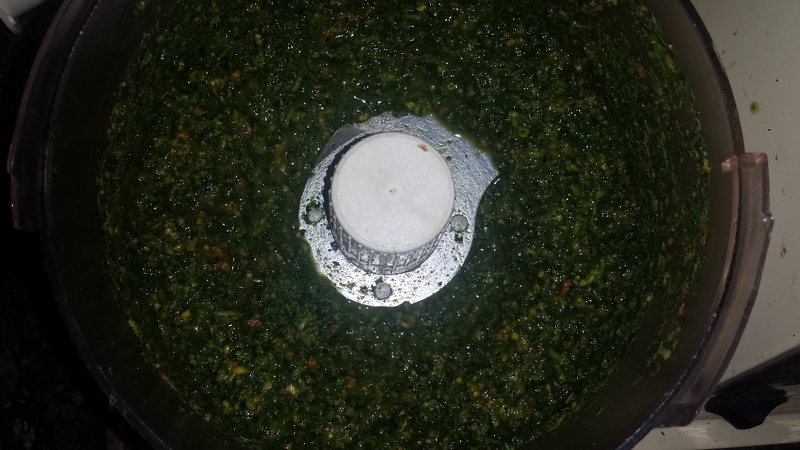 Drizzle over cucumber mixture and toss to combine. Sprinkle with crumbled feta cheese, if desired. New year equals new ideas. The holidays might be over but that doesn’t mean the presents have to stop! I finally decided to order a CSA (Community Supported Agriculture) box loaded with produce fresh from a local farm delivered right to my door – And my first one came today! Even though I was the one to order it, I still felt ridiculously excited to see two boxes with their mystery contents at my doorstep this morning when I got up. It felt like Christmas and Hanukkah all over again. Some of us will go to great lengths to extend the holiday season… For those that don’t know, CSA is an alternative ‘farm to table’ method for distribution of produce. Consumers sign up with a local company who arranges personalized home delivery of organically and locally grown fruits and vegetables. I signed with Farm Fresh to You, who supplies produce from Capay Organic Farm located about 90 miles Northeast of San Francisco. I chose the Traditional CSA Box but they offer many types and sizes of boxes, like Fruit or Vegetable Only, even a ‘No Cooking Box’. I decided to try this for a few reasons. 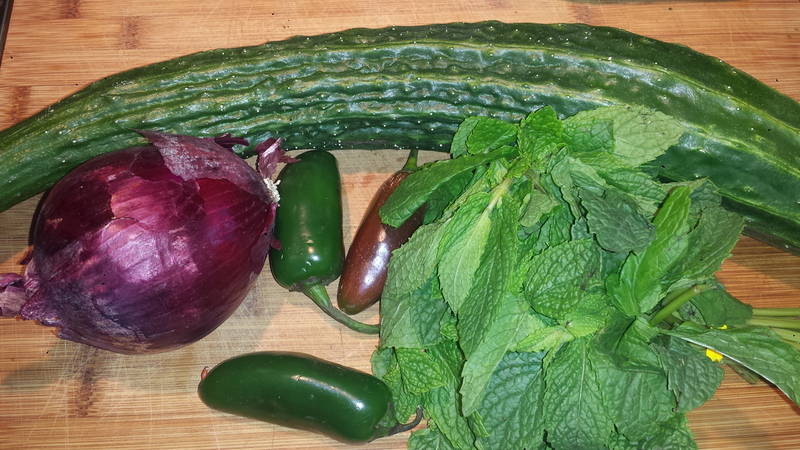 First, I love fresh produce and in the winter, my garden is a bit sparse (because I’m a fair weather gardener). 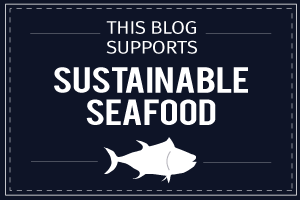 I also like supporting local farmers and eating with the season. Lastly, instead of going to the market and hand selecting items for dinner, I thought to stretch my creativity by having to figure out what delicious meals to make with the contents of my mystery boxes. What was in my box? Butternut squash, beets, rainbow carrots, Treviso radicchio, kiwis, baby bok choy, watermelon radish, fennel, red d’anjou pears, pink lady apples and assorted lettuce. Whew! After mulling the many possible ways dinner could go, I opted to use the most perishable items first, like lettuce. 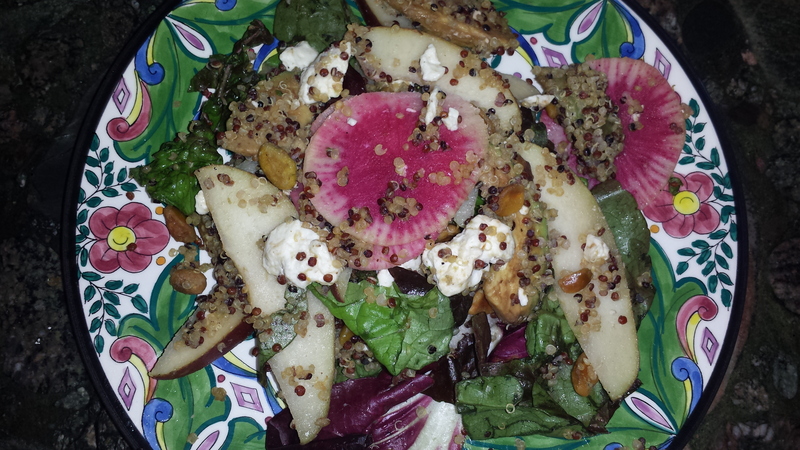 So salad it is… Winter Greens with thinly sliced pears, watermelon radish and avocado, coated with yummy crispy quinoa and crumbly feta with a few pistachios thrown into the mix. 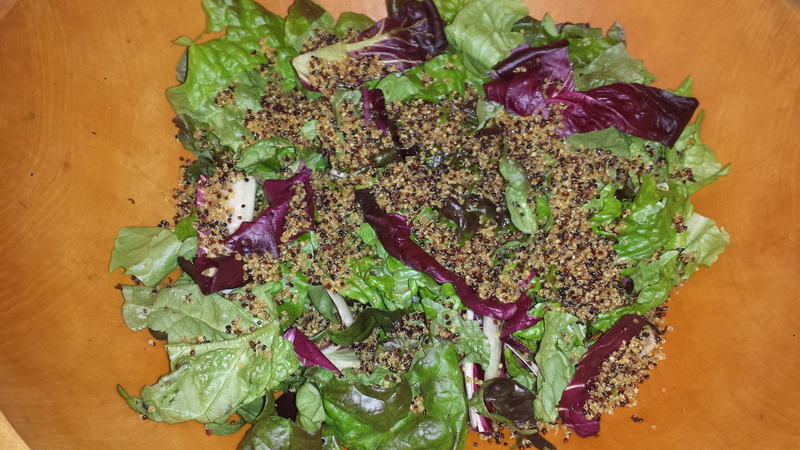 I added quinoa, not only to give my salad a nutrient boost with it’s high protein content and minerals like calcium, phosphorus, and iron, but also to enhance the taste and feel of the salad. When tossed with a simple vinaigrette, the crispy quinoa bits collect on the veggies making each bite a tasty treasure. 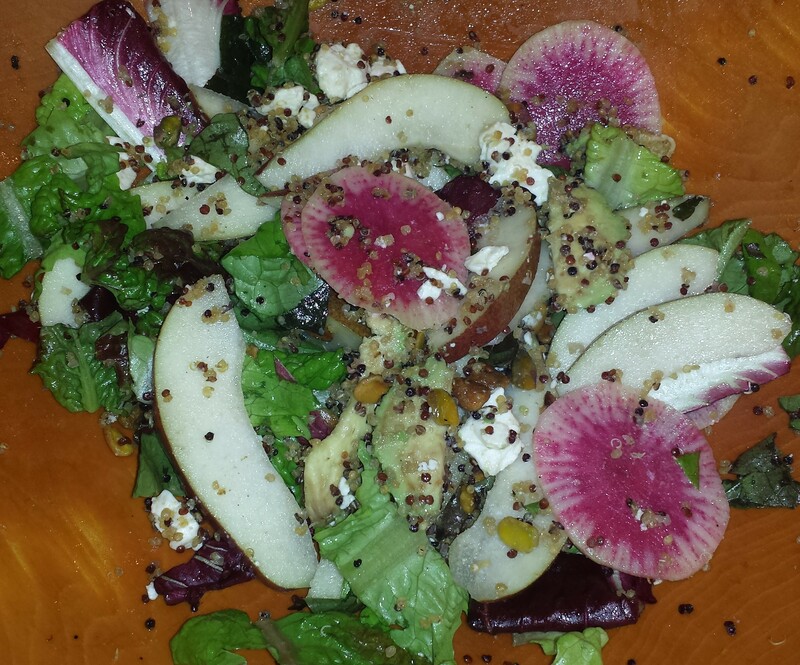 I first had crispy quinoa in a salad at Tamalpie Pizza in Mill Valley, CA. I was instantly enamored and only slightly dismayed to hear that the quinoa was deep fried. It was such a great concept, that quinoa can be transformed almost into something else. I don’t remember what else was in that salad except for leafy greens (and it is not currently listed on their menu, darn) so I made up my own salad with some help from my CSA box. 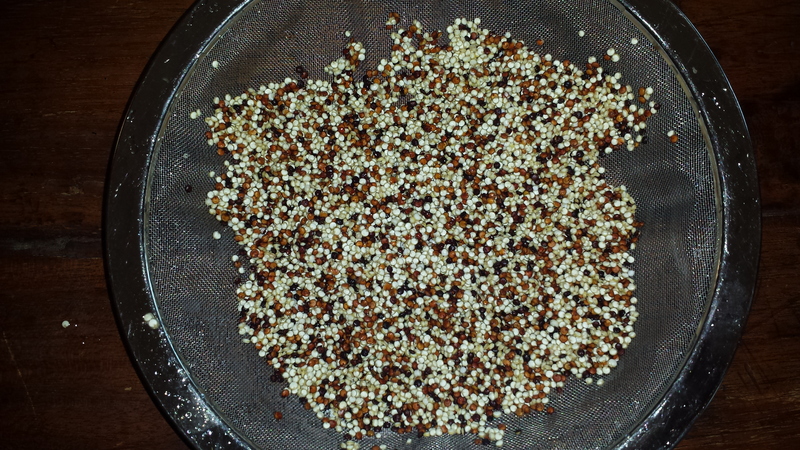 TIPS: Always rinse quinoa before cooking (unless the packaging says that it has been pre-rinsed) to remove any remaining saponins, a naturally occurring but bitter substance that the plant produces to protect itself from predators (smart, huh?) Use a fine mesh colander so you don’t lose any of the tiny grains. 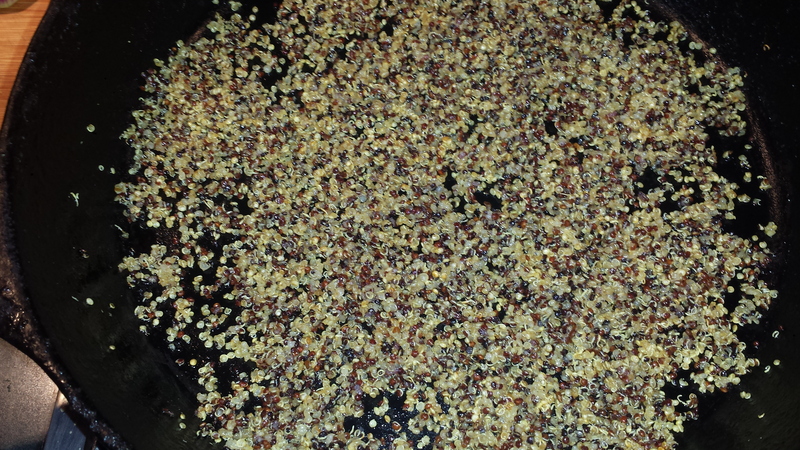 Rinse quinoa and simmer in salted water for about 15 minutes or until tender. All water should be absorbed. Let cool. Heat 1 Tbsn oil in a skillet until almost smoking and add in the cooked quinoa. Cook, stirring occasionally, until the quinoa pops and sizzles and turns crispy, about 5 minutes. Let cool. 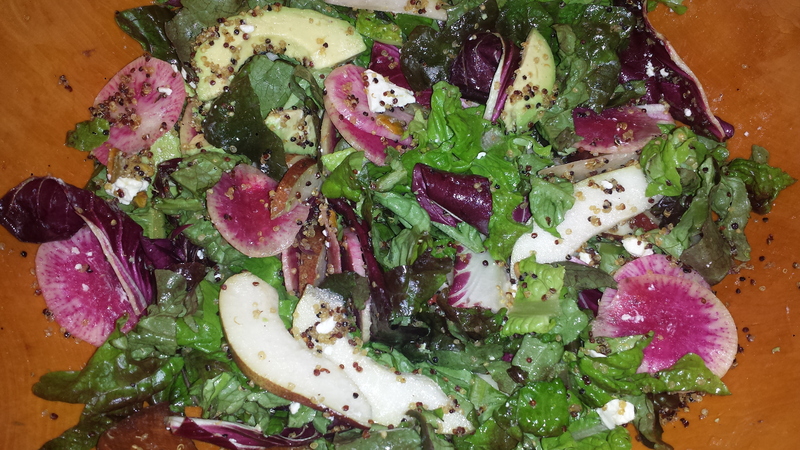 Thinly slice the radish, pear and avocado. 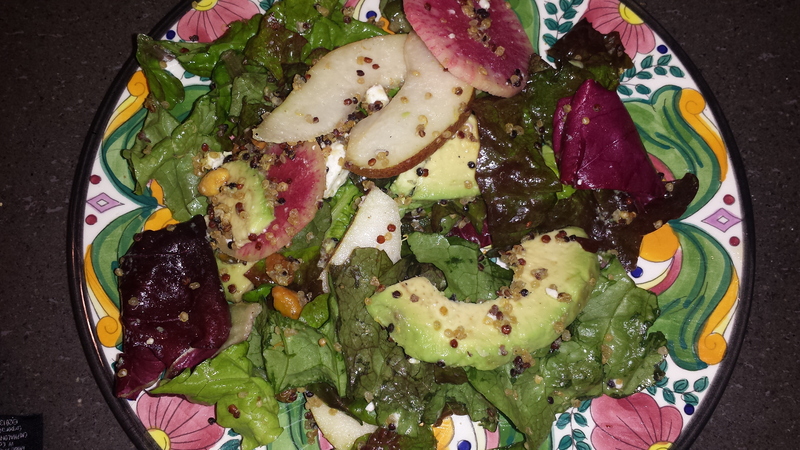 Top with the sliced pear, radish, avocado, pistachios and feta. Heat 1 Tbsn oil in a skillet until almost smoking and add in the cooked quinoa. 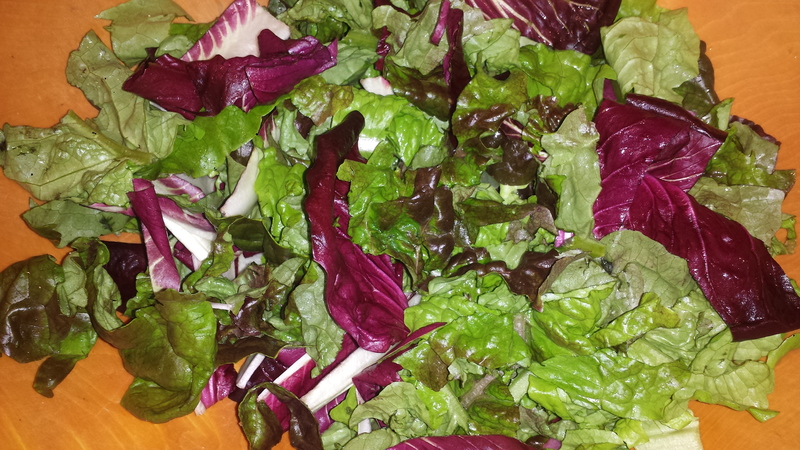 Cut or tear the larger lettuce leaves into pieces. Dress sparingly with the vinaigrette and toss gently. Is it a coincidence that fresh tomatoes ripe from the vine or juicy, just picked peaches taste especially good in summer or is it nature’s design to give us what we need? I was thumbing through some cooking magazines admiring gorgeous photos of carmelized tomatoes and 10 ways to use fruit when I came across an article, “In Season For a Reason:”, by Ellie Krieger in CookFresh Magazine that claims our bodies are ‘calling for them’, meaning seasonal veggies. “Not only do summer vegetables taste better and have a higher nutritional value, in season produce is in sync with our nutritional needs; it contains specific nutrients that replenish and protect us in the hot summer months”. Summer’s juicy fresh fruits and vegetables help keep us hydrated (20 percent of our water intake comes from the food we eat) and are rich in anti-oxidants, just when we need them most. Specifically, antioxidants like lycopene, vitamin C and beta-carotene help protect our skin from the sun by neutralizing damage to skin cells caused by the sun’s UV rays. Potassium, which we lose when we sweat, is also found in many summer vegetables. 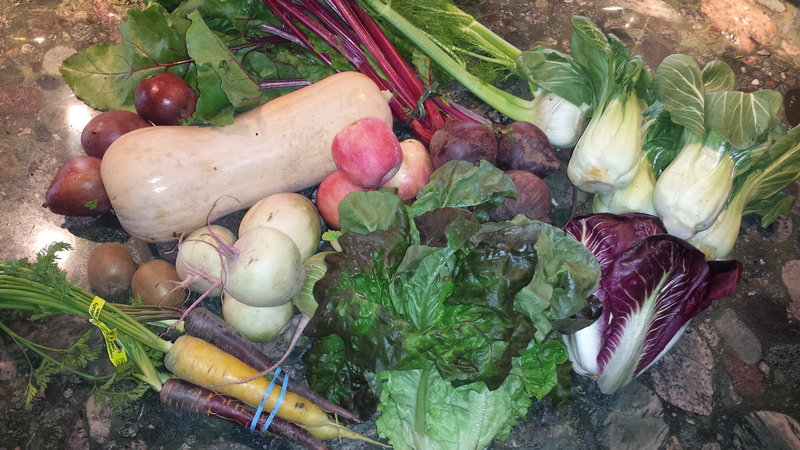 I wonder if winter vegetables give us what we need in winter too? I like combining seasonal fruits and vegetables, especially in salads. I often toss orange or grapefruit sections into my salads to give them a sweet and tangy boost. 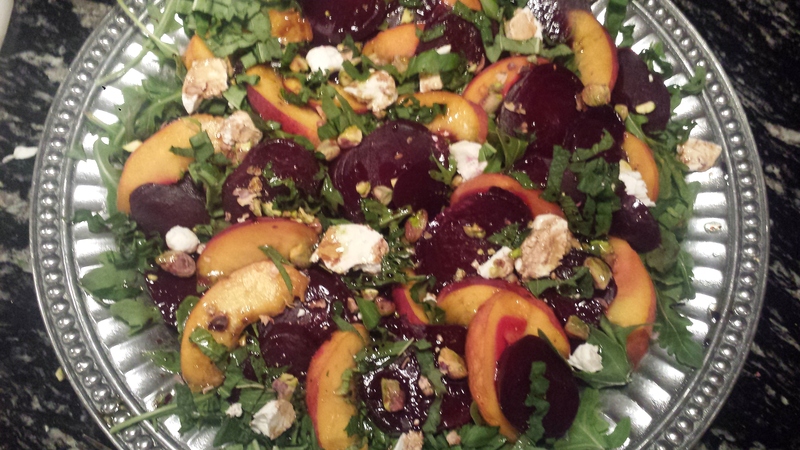 Today’s salad combines fresh, roasted beets, ripe peaches and arugula topped with goat cheese and pistachios. 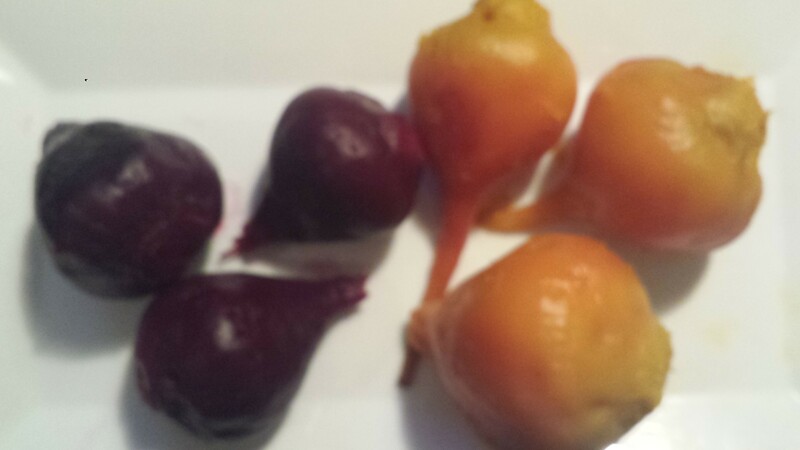 If I had them I would have added a few halved dark red Bing cherries or strawberries which are also in season. There is something about the combination of sweet and salty is really satisfying. 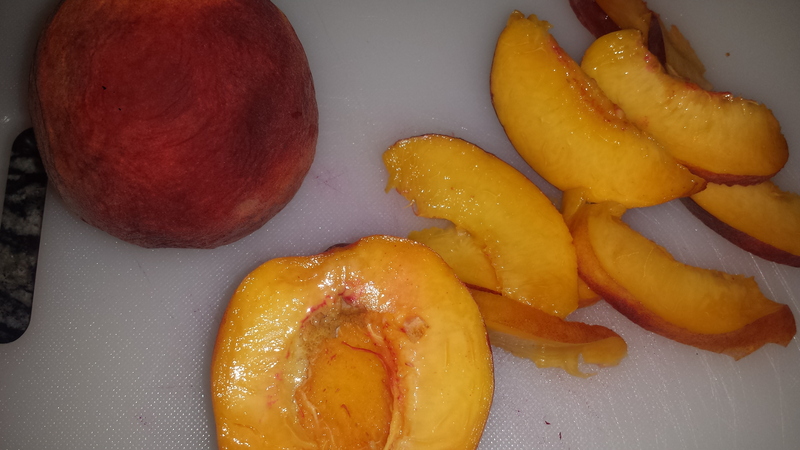 Right now with peaches in season, they are plentiful, delicious and less expensive at the height of the season! If you have the grill going, you can just halve and pit them and stick them on the grill for a few minutes to slightly caramelize them or just cut them up fresh and delicious. Like their intense color would suggest, beets are big on antioxidants, and have cancer and heart disease-fighting properties, as well as a host of vitamins and minerals. including iron. Roasting them brings out a more intense flavor and gorgeous color since nothing is released into water, as happens with boiling. If you slice them vertically, you may get heart shapes, which if you’re my pinterest friend, you know I collect hearts found in nature so couldn’t resist this picture. Too pretty! Don’t throw away the beets tops. They actually have more flavonoid antioxidants and vitamins than the beet roots themselves, including Vitamin A. They can be chopped and sautéed with a bit of olive oil and garlic for a delicious side dish similar to chard or mustard greens. 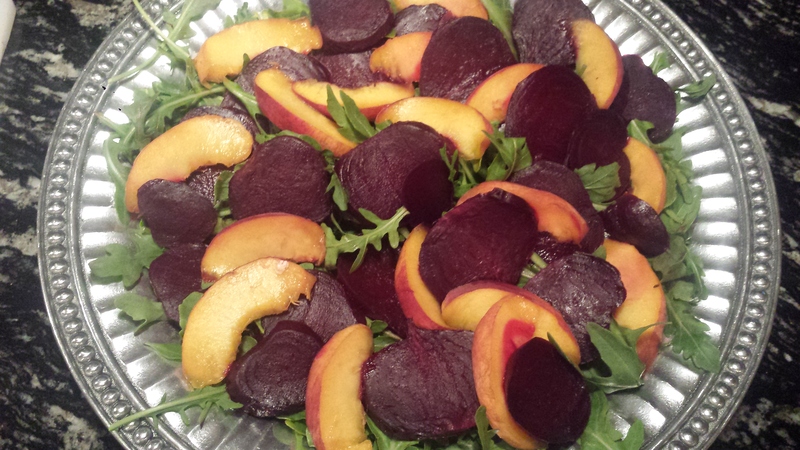 The beets can be roasted a day or two beforehand and stored in the refrigerator until you need them. Other than roasting the beets (which is easy but takes time), this is a very fast and easy meal to throw together, nice and colorful too! Preheat oven to 375 degrees. 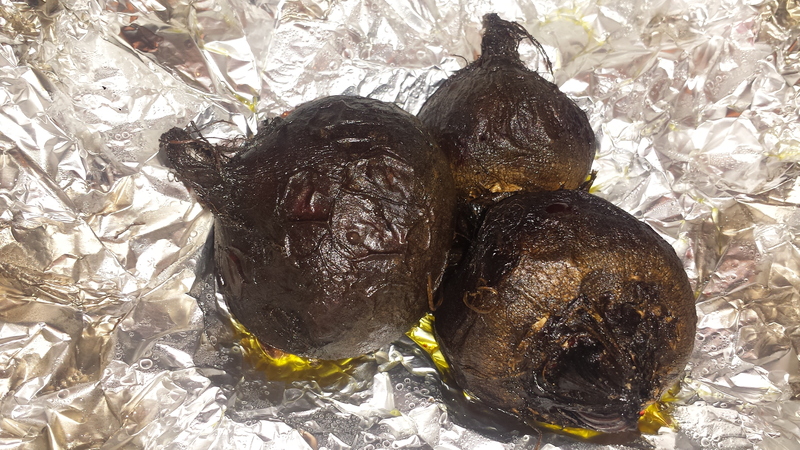 Lay beets on aluminum foil and drizzle with olive oil. Don’t remove the stem or tail. 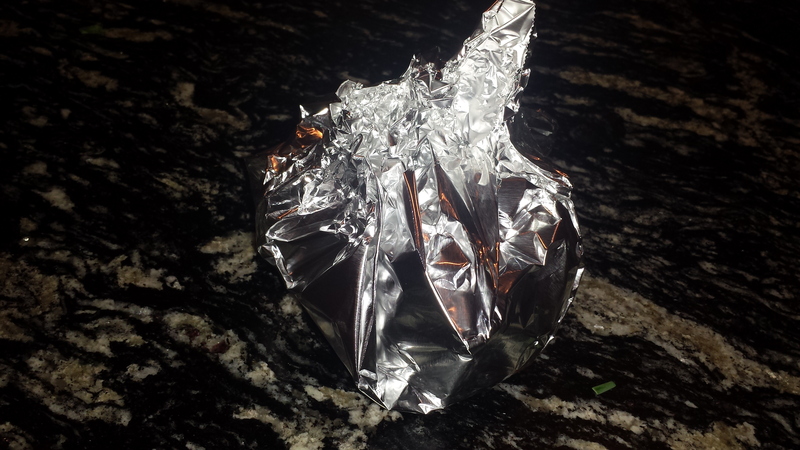 Wrap foil into a pouch and bake until the beets are fork tender, about 1 hour and 20 minutes. 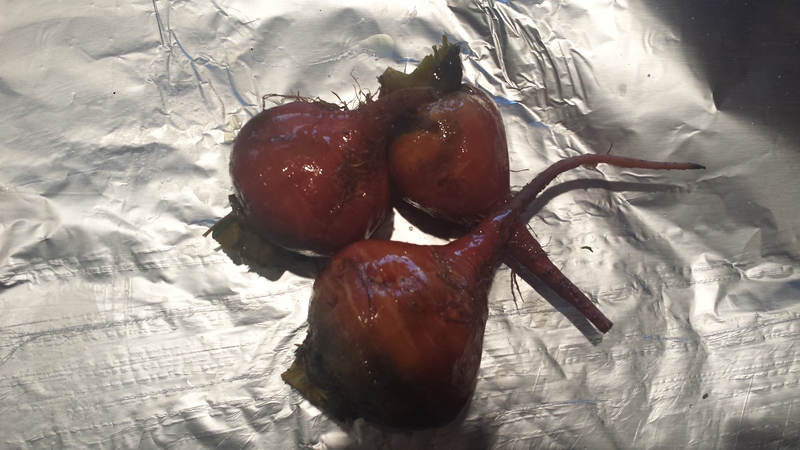 Let the beets cool, at least enough to handle, and remove the skins, stem and tail. I like to use paper towels so my fingers don’t turn red. Set aside and let them cool to room temperature, then slice. I would recommend using a non-porous cutting board, since the juice from the beets stains everything it touches, including your hands. Wash, remove the pit and slice the peaches. I like the skin but if you don’t, then remove the peel before slicing. Place the arugula in the bottom of a large serving bowl or platter. 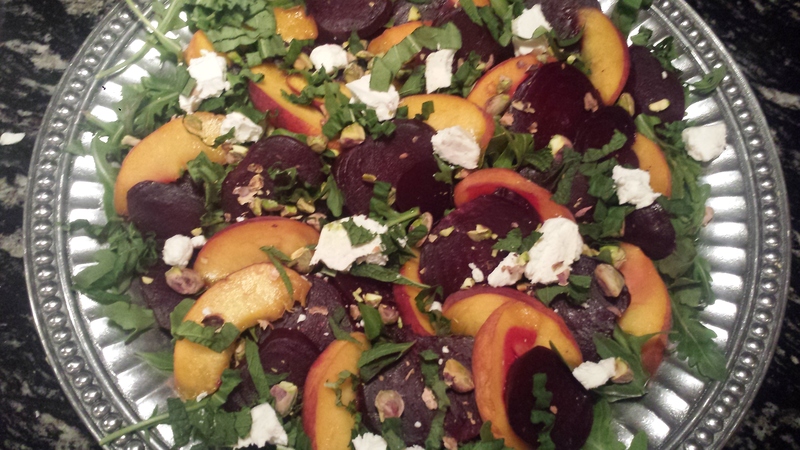 Add the sliced beets and peaches. Top with pistachios and goat cheese. In a separate bowl, whisk together the olive oil, balsamic vinegar, salt, and pepper and pour over the salad before serving. Last summer, spent at our Maine house, was a balancing act when it came to dinner, which we rotated among friends and took turns hosting. I had just begun the Good Mother Diet, my husband was protein heavy and mostly carb free and our friend, Rick went back to our ancestral roots with the Paleo diet. Well here is a meal that satisfies all three! 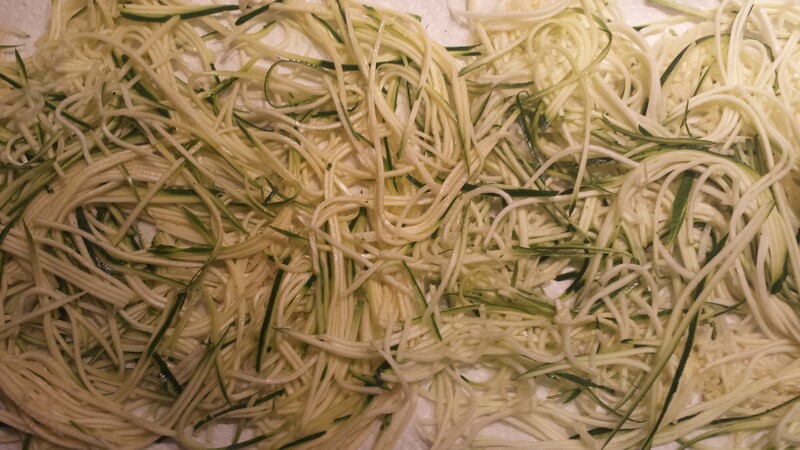 The pasta is not real pasta, but noodles made by slicing zucchini into long, skinny spaghetti-like ribbons. 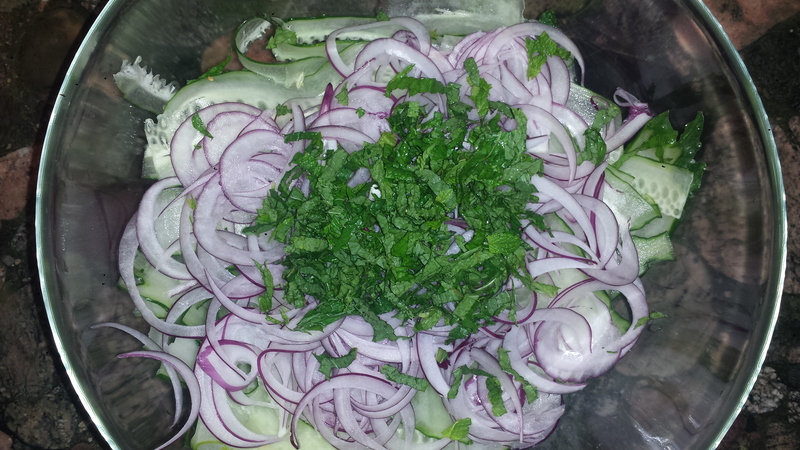 For this a mandolin works best, however, you can also use a grater, zester or potato peeler but it won’t look as nice. If you want it to look even more like spaghetti, you can peel the zucchini before cutting it but I prefer to keep the skins (and vitamins) in the dish. 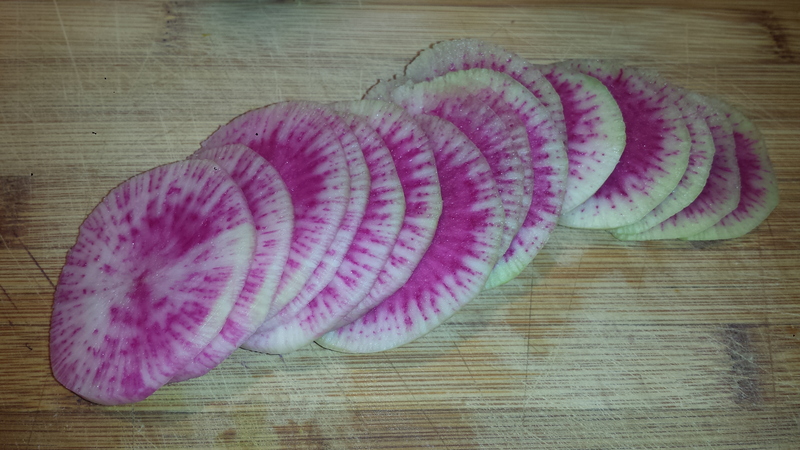 This is my favorite way to prepare beets. Roasting, rather than boiling, intensifies the color and flavor, plus it is by far the easiest way to remove the skin. 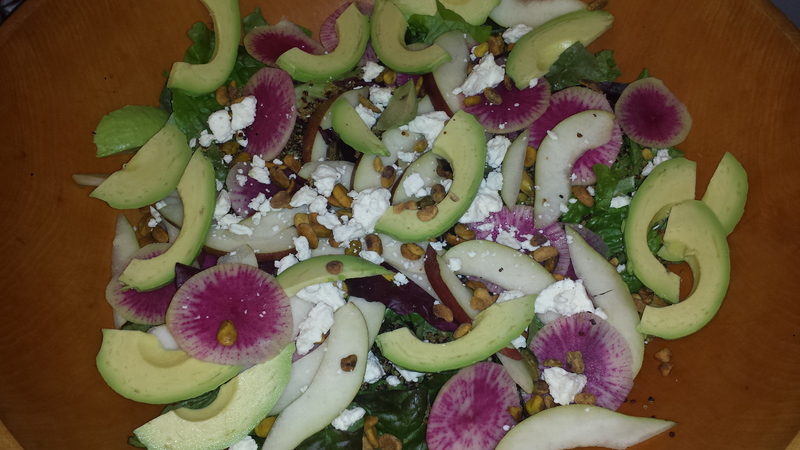 Using varieties with different colors makes for a prettier dish. If making the entire meal, start by roasting the beets since that can take a half hour or so, depending on the size of your beets and get the zucchini ‘pasta’ going. 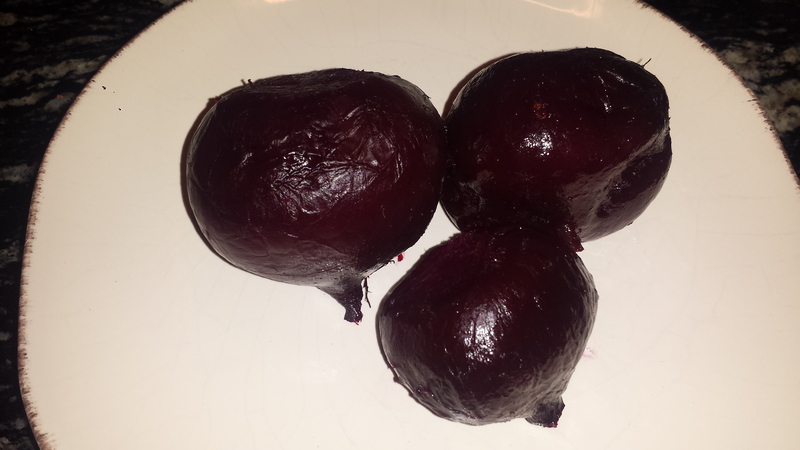 The beets can be made ahead of time and will last in the refrigerator several days. The actual cooking time of everything else is pretty short and should be done just before serving. Paleos, like Rick, should omit the pistachios, cheese and seasoning/salt. 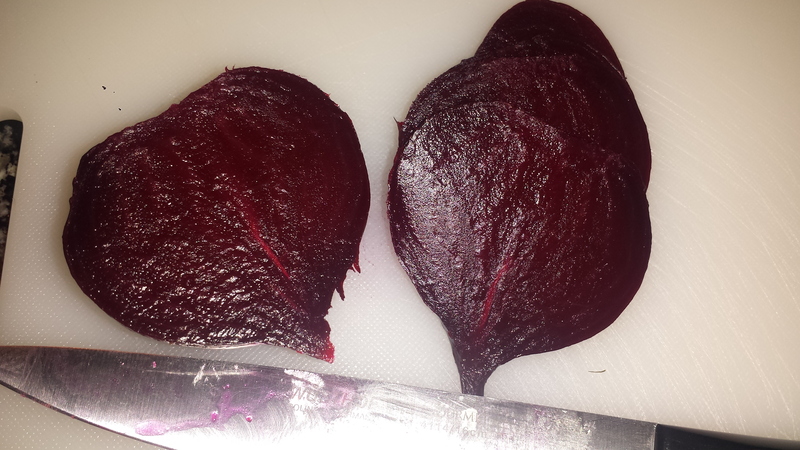 Cut leafy stalks off the beets, taking care not to cut into the flesh. (You want to keep all the juice inside). Reserve leaves for another use or chop them and saute in olive or butter with garlic and serve on the side. Wash and dry beets but don’t peel them. (The peel will slide off easily after they are roasted). Lay them on a large piece of aluminum foil. 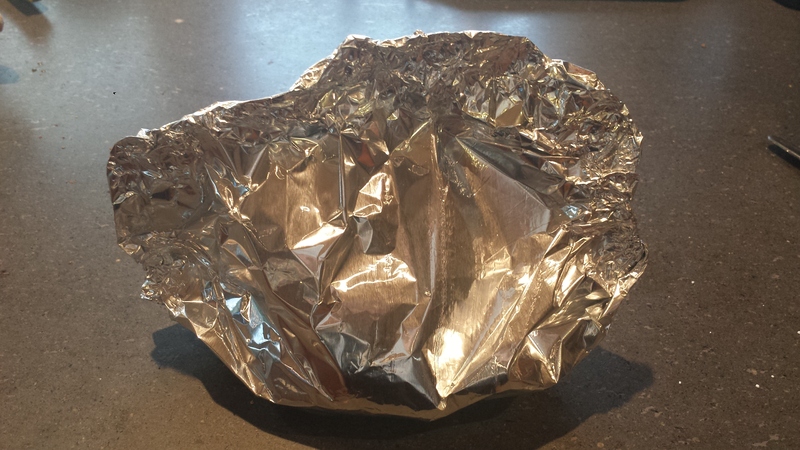 Brush them with olive oil and fold the foil up and seal into a leak-proof package, or you can use a covered baking dish. Bake at 400 degrees for about 45 minutes or until you can easily pierce them with a fork. 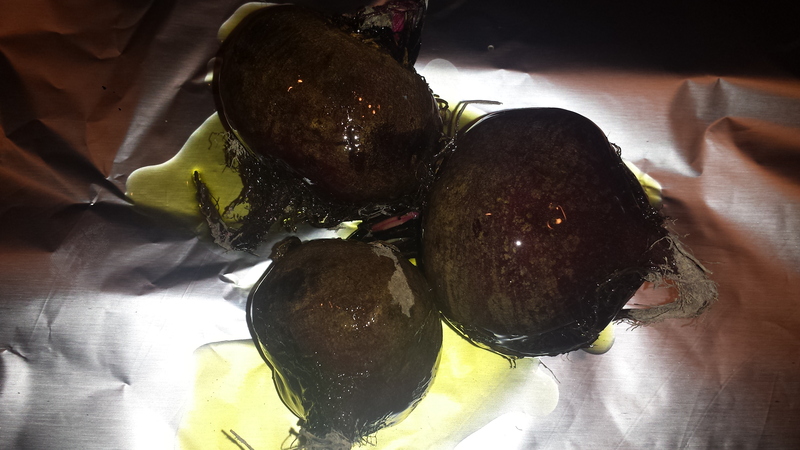 Larger beets can take up to an hour, so check often. Be careful when you open the pouches, as they will be very steamy and can burn your fingers. Remove from heat and let cool. Once they are cool enough to handle, slip the skins off by hand or with a papertowel. (You will be surprised how easy it is). Slice and serve with lettuce and sliced apple. Drizzle with vinaigrette and top with feta, if desired. with a papertowel and press down gently. Let them ‘sweat’ for about 30 minutes to remove the extra moisture. 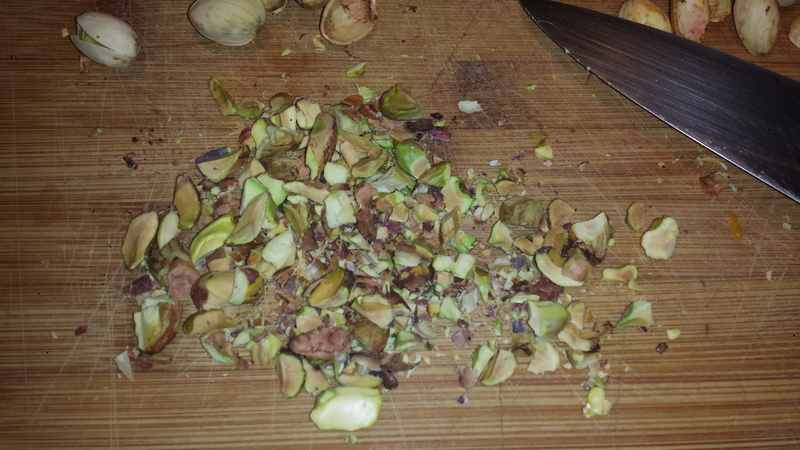 Toast the chopped pistachios in a small, dry pan on medium heat for a few minutes (until you can smell them cooking). Let cool. Heat olive oil and butter in a saute pan over medium heat. Add the garlic and saute for a few minutes. 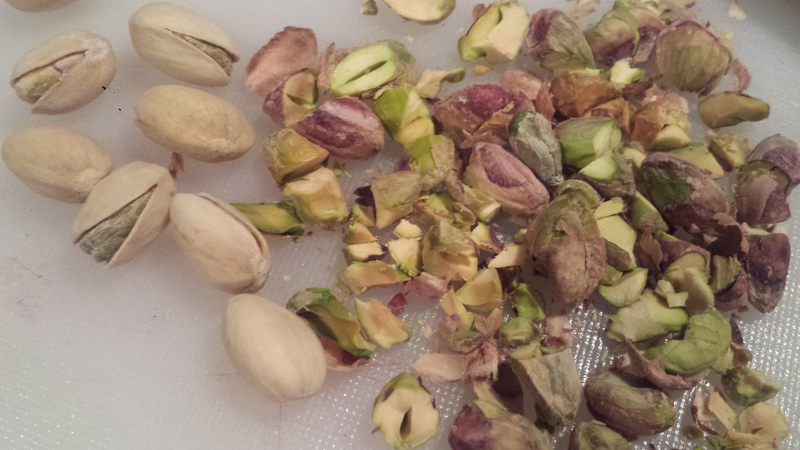 Turn off the heat and add ‘pasta’ and pistachios. Toss gently. Top with parmesan if desired..
Wash and dry scallops. Put them in a bowl with the oil and seasoning. Gently mix until scallops are coated. The oil should not pool in the bottom of the bowl. Pour off excess oil that doesn’t mix back in. 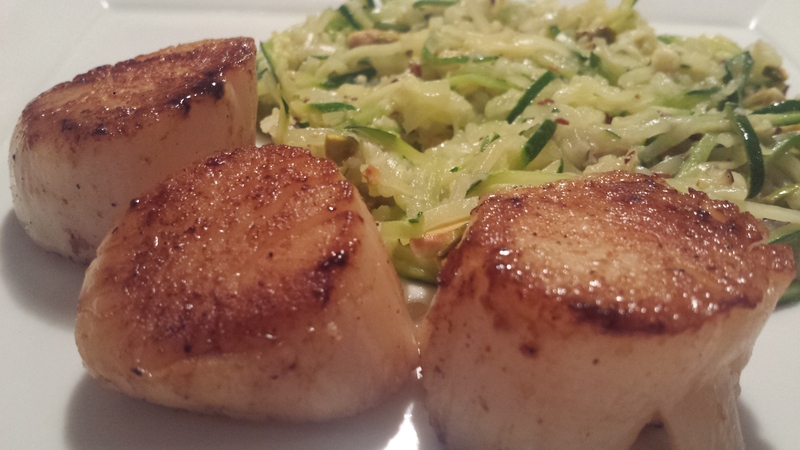 The scallops won’t sear if there is too much moisture or oil. Heat a cast iron, or other skillet, on medium high to high heat. The pan should be very hot. Cook scallops in a single layer, without crowding. You may have to cook them in two batches. Cook for about 2 minutes or until golden brown. Turn and cook the other side 2 minutes. Remove scallops from the pan. Add wine to the hot pan and stir to deglaze and reduce the liquid to make a sauce. If you overcook and too much liquid goes away, just add a bit of water. To serve, place ¼ of the ‘pasta’ mixture on each plate. Top with ¼ of the scallops. Drizzle with wine sauce.